Let’s Raise a Paw for Fort Mac! Canada has come together to support the victims of the Fort McMurray fires in a remarkable way, and we want to get involved by helping the families and pets that have been affected by this tragedy. From May 16th-31st, all nail trims are by donation! 100% of the proceeds will benefit the Calgary Humane Society. You do not have to be an existing client to support this cause. To ensure we have adequate staffing, nail trims will be by APPOINTMENT ONLY so please give us a call at 604-464-3343 or use our Make an Appointment form to set up a time. Please mention you are supporting our donation drive when booking the appointment. We are only accepting cash donations. Suggested donation is $15 per pet and ERABH will match donations! 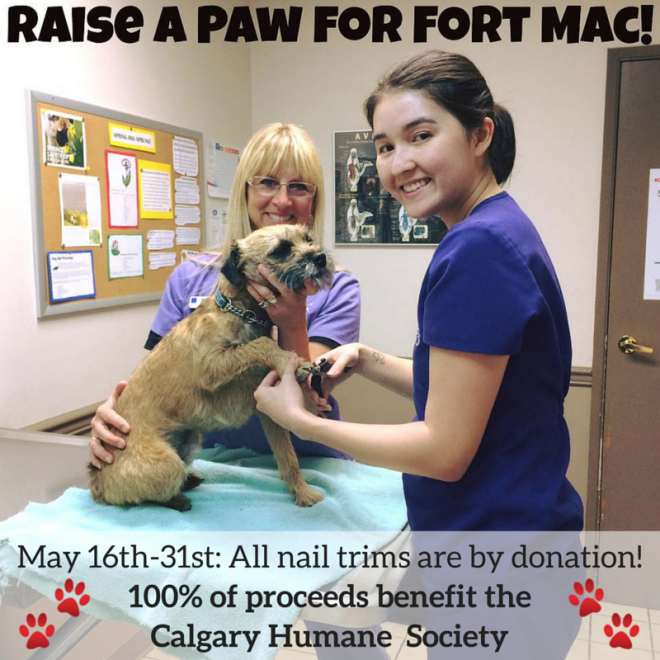 Whether you have a dog, cat, rabbit, guinea pig, ferret or bird, bring them in for a pawdicure and help the families and pets of Fort Mac! Please note: it will be up to ERABH’s discretion to perform nail trims on anxious, fearful or aggressive pets. Even if your pet does not need a nail trim but you want to support this cause, feel free to drop by the hospital with your donation. Raise a paw for Fort Mac and share our donation drive with all your pet loving friends!